Calling Google "too big for its britches," the lead marketing official at Mozilla last week belittled browser rival Chrome as domineering and implored users to give his company's Firefox another try. In response, a former Mozilla chief technology officer argued that Firefox is "declining unsustainably" even after Mozilla reenergized Firefox development. "Chrome is not evil, it's just too big for its britches," wrote Eric Petitt, Mozilla's director of product marketing, in a blog post where he claimed his comments were strictly his, and not reflective of his employer. "Its influence on the internet economy and individuals is out of balance." Petitt's argument was not that Chrome isn't in the browser driver's seat, but that its dominance and Google's business model is detrimental to the Web overall. "Google built [Chrome] to maximize revenue from your searches and deliver display ads on millions of websites. To monetize every... single... click," Petitt said. The solution? Run Firefox, urged Petitt, who touted the performance improvements Mozilla has made in the last several years, including the staged release of a multi-process Firefox that will bring additional content processes to users in version 54, slated to ship June 12. Mozilla's new online ad campaign, dubbed "Browse against the machine," relies on those same arguments of Chrome's share supremacy and Firefox's new skills. But Petitt felt the need to preempt critics of that effort. "Some folks might interpret 'browse against the machine' as a desperate cry, but it isn't," Petitt asserted. "Firefox grew in users last year and Mozilla is financially healthier now than it has ever been." Desperation may be in order, countered Andreas Gal, former Mozilla CTO. In a post to his personal blog, Gal used data provided by Irish analytics vendor StatCounter to forecast Firefox's -- and other browsers' -- future. The trend line wasn't pretty. "Despite an expanding market both [Microsoft's Internet Explorer] and Firefox are declining unsustainably" on personal computers, Gal concluded. "Firefox is not going anywhere. That means that [it] will be around for many many years, albeit with an ever-diminishing market share. It also, unfortunately, means that a turnaround is all but impossible." Browsers are commodities, Gal asserted. "They all pretty much look the same and feel the same. All browsers work pretty well, and being slightly faster or using slightly less memory is unlikely to sway users," he added, disputing Petitt's contention that improvements would return Firefox to growth. According to U.S.-based metric firm Net Applications, Firefox's global users accounted for approximately 12% of those who went online in April. 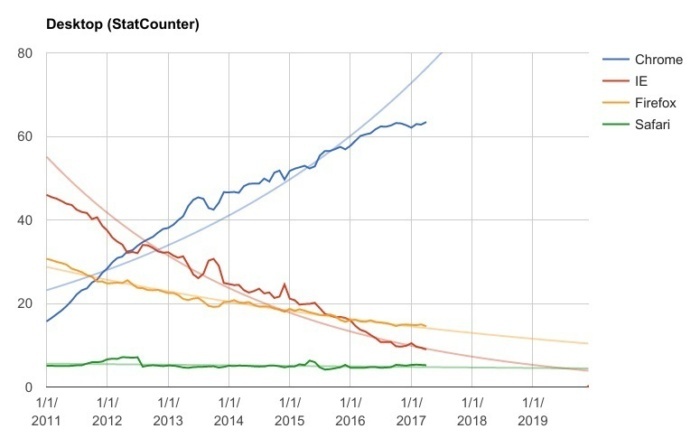 Net Applications data echoed that from StatCounter, and predicted a continued decline in Firefox's fortunes: Within a year, Firefox's user share will drop under the 10% mark. 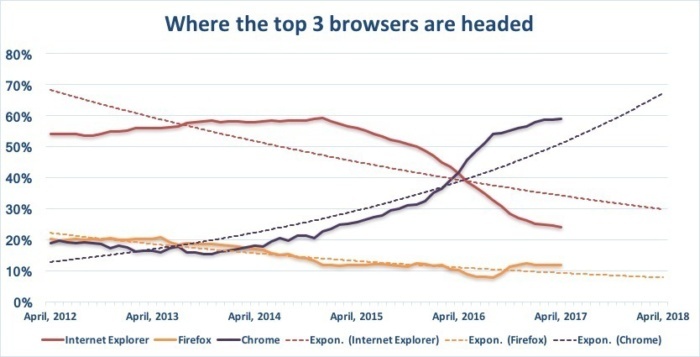 Data from analytics vendor Net Applications -- and the resulting trend lines -- came to the same conclusion: Firefox has no chance of reclaiming share from Chrome, the browser that ate the world. 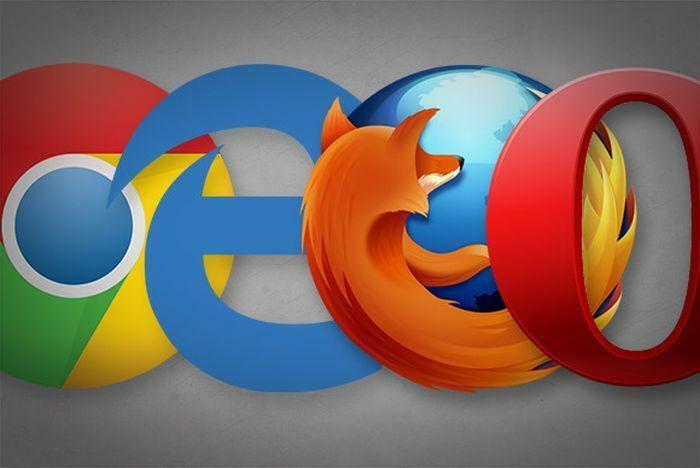 Like browser users worldwide, those in the enterprise have overwhelmingly adopted Chrome, experts said last week in interviews. Firefox is essentially off the business radar. That's not surprising. Mozilla has a change-resistant release channel -- called "Extended Support Release" (ESR) -- that remains static for around a year, but Firefox lacks the management basics because it doesn't support group policies in Windows. While Chrome may not match the extremely granular management that can be applied to Internet Explorer -- and its successor, Windows 10's Edge -- compared to Firefox, it's an admin's dream. Petitt never mentioned "enterprise" in his call to battle, but the Firefox strengths he ticked off, including data and privacy advantages, were general enough to apply to all users, not only consumers or enthusiasts. But Gal's analysis rang truer: Chrome won, game over. "I don't think there will be a new browser war where Firefox or some other competitor re-captures market share from Chrome," Gal said. "If even Eric [Petitt] -- who heads Mozilla's marketing team -- uses Chrome every day as he mentioned in [his] first sentence, it's not surprising that almost 65% of desktop users are doing the same."